Seventeen-year-old Lon Marcs discovers he has been blessed—or cursed—with this gift. He cannot control the power of True Sight and feels it killing him with each passing day. He realizes that the only people who might possess the knowledge to save his life are the sworn enemies of his king. To obtain their help, Lon would have to journey into exile, leaving behind his village, family, and beloved Kaylen. 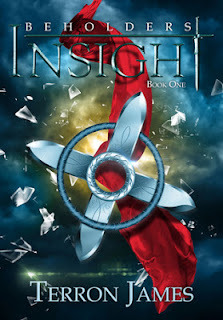 Beholders, Book One: Insight - YA high fantasy. Before I get into the meat of this, look at that cover. Seriously, look at that gorgeous cover! I could stare at that thing for hours. Thanks to the fine folks at Jolly Fish Press who offered me an ARC (Advanced Reader Copy), I got to do just that. Then, I cracked the book open to check out the goodies waiting for me inside. Books that don't rely on grab-me-fast gimmicks are hard to come by these days, but in Terron James's debut novel, you get to relax and enjoy the scenery and savor the dialogue. This is an excellent YA high fantasy novel! A few of the aspects I liked best: unexpected turns as the story progresses, the relationship of the main character (Lon) and his twin sister, and the cultural elements and holiday building shown by village customs and the fact that not everyone enjoys themselves during a party. It's the little details that grab my attention, such as when a boy becomes of age, tradition is he is to dance with every eligible girl, be they 15 or if they "have one foot in the grave." Not only that, but a unique magic (or curse, if you will) that, while other stories seek to harness or control this power (which Lon wants to do, ultimately), he is unable, and the slightest shift of emotion can bring great harm or death to himself or others. When Lon knows this power is capable of harming his betrothed, it leads to some very difficult choices. This book has all the elements that fantasy readers will love! Do I have any complaints? Minimal ones, at best. The beginning was a bit foggy, and it took a few pages to know which key characters I needed to pay attention to, but that soon resolved itself, and from what I understand some changes have occurred since the printing of this ARC, so an official copy may very well solve this and other little issues. At other times (not often), the dialogue didn't seem to match the characters, as in, young characters sound more mature than their age, but then, some kids are rather mature, so it didn't distract me. Now, without spoiling anything, this book has a cliffhanger, and boy, does it have a cliffhanger! A very well executed one, I might add. Terron knows how to end a book, because I want the next one! If you are looking for a fresh voice in the arena of the classic Heroes Journey, Beholders: Insight is the read you've been waiting for! What do you guys think? Anyone in search of a YA high fantasy? Which ones are your favorite? You think this market on the rise? I'm David, and if you find a Jaed, be sure to let Lon know! Cover art is cool. Is this the author's first book? Sounds like a good read! I'll have to watch for it. Nice review. That is an awesome cover. Sounds like a good read. Cover art is indeed, very enticing! Sounds like a suspenseful read. I do like the cover, but at the same time, I'm wondering what the hell that I'm looking at? The cover rocks! *Stares* This sounds like a great read, thanks for sharing David. Wish I could, but I'm booked for that day. This sounds awesome! Thanks for sharing your thoughts on this! This was a very entertaining story. I enjoyed it. Thanks for the review. Sounds like a good one. I love a good cover, and though they say you shouldn't judge a book by its cover, I tend to do just that. This is now on my TBR list. Thank you for the recommendation. I really like high fantasy but don't read much YA. I will be looking for this as it sounds very unique. I like the idea that this power is uncontrollable for at least most of the book. Problems that get solved too easily diminish a book's conflict, and I like to see a MC make LOTS of mistakes! That ups the tension, too! great book recs over here lately! i especially like seeing the fantasy! i hope its on the rise, i love it!